My favourite thing about the run up to Christmas (and also my favourite thing about the day itself) is the food. Everyone wants to catch up over food and drinks which is just fine by me (if not by my waist line!). Last Friday our admin team had their mini Christmas get together and very kindly invite myself and the other IT guy along since we can’t attend the Aberdeen IT lunch given that they’re 500 miles away. It was a very last-minute thing so we ended up going somewhere just a few minutes walk from our office; one of the two restaurants housed within One Aldwych Hotel, Indigo. The restaurant is on a mezzanine floor looking out over the bar and despite clearly being a more upmarket venue still felt very relaxed and laid back with the comfiest chairs I think I have ever eaten in. Our waiter was incredibly helpful and very knowledgable despite only having worked at the restaurant for four weeks. (Although he did top up my still water with sparkling mid-way through the meal, yeuch!) 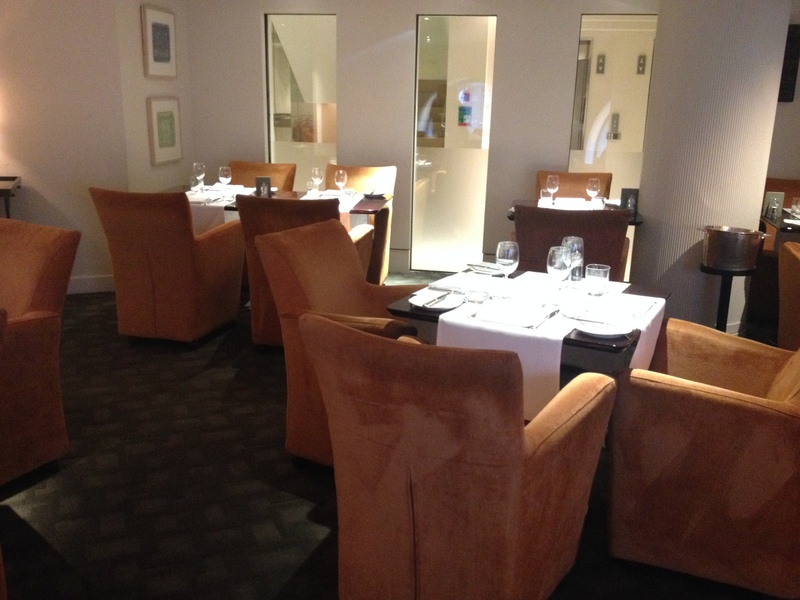 As it was a lunch time we had the choice of either the a la carte or fixed price menu both of which change frequently. 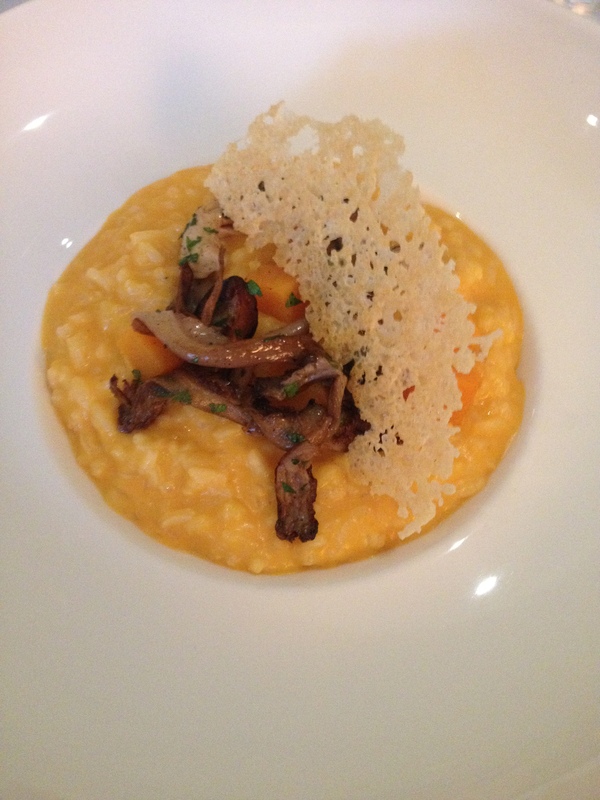 Not really taken with any of the set menu options and not entirely sure who was paying for it (it ended up as another free meal for me 😉 ) I went with one of the cheaper items on the menu at £15; butternut squash risotto with wild mushrooms and aged Parmesan. Yes, it does look a bit like Donald Duck! It arrived beautifully presented as did everyone elses dishes and while it was nice I actually found it a bit bland even when I crumbled the aged parmesan into the risotto itself and I was left with food envy wishing that I’d gone for the fillet of pollock with farfalle pasta and mussels (which had been my original choice) instead! I have no idea what the total bill was for the seven of us but it couldn’t have been cheap. Everyone else had nothing but compliments to say about their own dishes and their create your own salad looks particularly good value for money so perhaps I just picked the wrong dish. I’d definitely go back for the atmosphere and service alone. The hotel had a Charlie and the Chocolate Factory themed Christmas tree underneath which you can indulge in their similarly inspired afternoon tea which I would love to try but at £34.50 per person that is definitely a once in a lifetime treat if ever!